Dear Lord, please give me the strength and restraint to not strangle my corporate husband for his temporary bout of insanity. He desperately wanted to go golfing with his college buddies, but had a very important business meeting. Please help me understand why he would think our Mr. MacSchmooky was the obvious choice to represent him. And, even crazier . . . nobody noticed, Amen. I’m not one to cast aspersions but he looks a bit rough, if you ask me and I know you didn’t. But Donna, he loves retrieving the balls that end up in the water hazards! 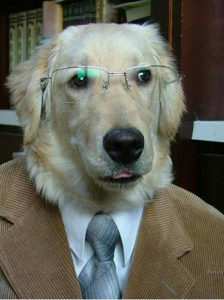 Mr. MacSchmooky looks like he’d be the perfect one to help you set up a 401K-9.